WASHINGTON, D.C. — Georgetown University students on Thursday voted to approve a new student fee to create a fund for the descendants of slaves sold by the university in the 1830s. The vote’s results were announced after a contentious day on campus with proponents of the measure hosting a rally on campus, chanting “when they don’t act — we fight back,” and encouraging students to get out the yes vote. Some opponents of the measure, meanwhile, told The College Fix their fliers explaining arguments against the referendum were torn and discarded and that they felt scared to voice their opinions. Of the 3,845 students who voted in the spring election, 2,541 students — or 66.08 percent — voted to approve the measure, according to the official announcement of the results presented by the Georgetown University Student Association Election Commission late Thursday night. The turnout is considered among the highest ever for the private, Catholic institution. 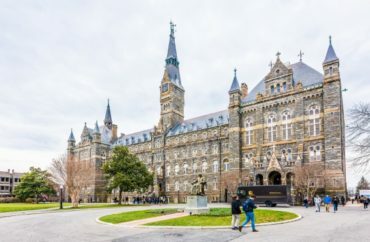 The proposal, put forth by Georgetown University Student Association senators in coordination with the GU272 Movement, is one step closer to becoming the first slavery reparations policy in America. It calls for the establishment of a fund for the ancestors of the 272 men, women and children sold by Georgetown in 1838. The student resolution will now be considered by the Board of Directors, which will likely have the ultimate authority on whether the fee will be officially implemented. During the afternoon as the voting took place, roughly 40 students rallied to support and defend the measure. “I think it’s an excellent example of student activism and student action,” student Kakazi Kacyira told The College Fix on why she supported the referendum. Opponents criticized the lack of oversight and clarity of the funds’ use, burden on low-income students, and the compulsory nature of the policy. GUSA Senator Sam Dubke, who led the “Vote No” movement from the chamber, reacted to the results by telling The College Fix he was unsurprised but disappointed in the tactics of the other side. A “Yes” vote on the referendum would recommend to the Georgetown Board of Directors a GU272 Reconciliation Contribution and Board of Trustees. A “No” vote on the referendum would not recommend to the Georgetown Board of Directors a GU272 Reconciliation Contribution and Board of Trustees. The proposal advocates that beginning in Fall 2020, undergraduate students would contribute $27.20 to honor and memorialize the GU272. The funds raised by the GU272 Reconciliation Contribution will be allocated for charitable purposes that benefit the descendants of the GU272 and others once held in slavery by the Maryland Jesuits. Similar to the student activities fee, the referendum recommends that the contribution should be adjusted annually for inflation. It further recommends special consideration for causes and proposals that directly benefit descendants still residing in underprivileged communities. To facilitate these charitable projects, the referendum recommends the creation of a GU272 Reconciliation Board of Trustees, which would consist of five GU undergraduate representatives and five representatives of the descendents of the GU272. Over the past few years, Georgetown has worked to reckon with its legacy of slavery. It officially apologized for the sale in April 2017. Campus officials also renamed two buildings named after the Jesuits involved in the sale of the slaves, and created an African American Studies Department. The university also agreed to “offer an admissions edge to descendants of slaves as part of a comprehensive atonement” for the school’s past actions. 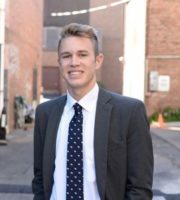 Dalton Nunamaker is a government major at Georgetown University. Originally from mid-Missouri he worked on Senator Josh Hawley's (R-MO) campaign and is on the board of the Georgetown College Republicans. He is a cadet in the Georgetown Army ROTC Hoya Battalion and a member of Georgetown Right-to-Life and Campus Outreach ministry. He is interested in political theory, public policy, and the constitution and is active in the Georgetown Institute of Politics and Public Service.